Alumni Titans "In the News"
Our mission is to challenge Trinity students to discover their paths, develop their talents and strengthen their character. How do we know we’re on the right track? Take a look at the paths taken by some of our alumni who have been recognized by the press and the public for their unique talent and firm character. 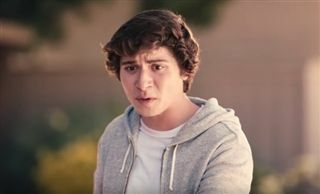 Austin Zajur's '14 appearances in funny TV commercials is "just the beginning for this talented, scene stealing actor... Next up for Zajur is the big screen appearance in Scary Stories To Tell in The Dark." 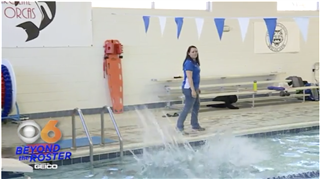 Christy Guise-Wright is coaching Caroline High School's first swim team. About 80% of the swimmers had never swam competitively before. "We have a swimmer who has dropped 30 seconds off her 50 freestyle time in the first three weeks" Guise-Wright beamed. "That does more for a child than almost anything else can possibly do to make them feel good about themselves." 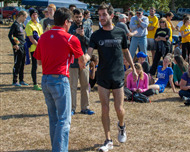 Two-time ODAC Male Runner of the Year, Bridgewater senior Jamie Hiegel finished in 59th out of 280 athletes at the NCAA Division III men's cross country championships at the University of Wisconsin-Oshkosh. Emma '16 and Addie '18 Nash have played field hockey together from the time they were 7 and 9. 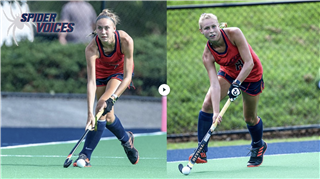 Now, after a two year break from playing together, the sisters are reunited on the University of Richmond field hockey team. 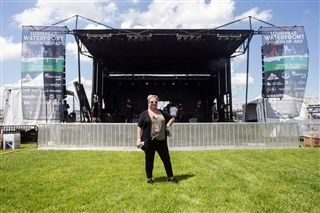 Alene Day is "one of the most sought-after backstage concierges in the music business"
Alene Day '89 is rock star concierge; a job of a endless requirements. 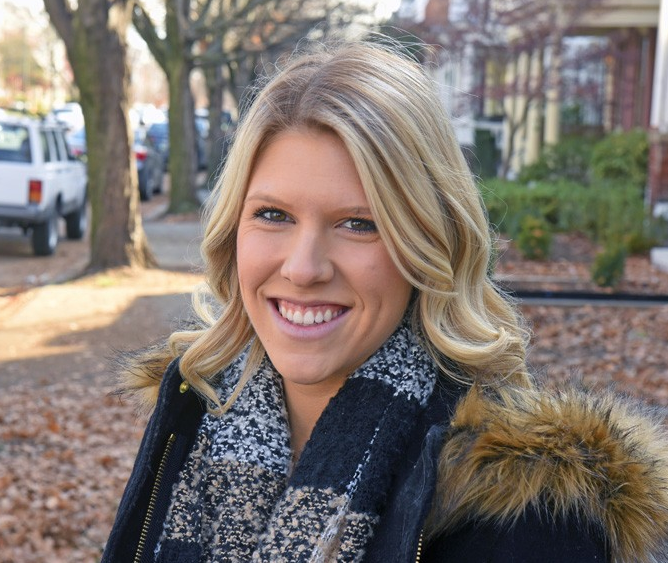 "It's her job to ensure that your favorite artists, from Taylor Swift to Stevie Nicks, have everything they could possibly need when they perform in Louisville." 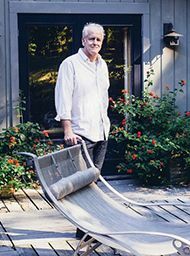 At 26, Chris Snowden '07 took the project lead on designing a 2,500 square foot, single story Midcentury Modern home in Chesterfield County. 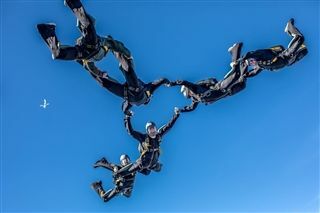 Camm Johnson '14 and his parachuting team teammates completed a six-man formation in 9.16 seconds which set a national record. The Influencer Effect: Why do so many people care what these social-media titans think? Daddio's account at @restoring_radiance describes her recovery and the 180-degree turnaround she made in her relationship with food as going "from darkness to light." Around the time she hit 10,000 followers, she says, brands started contacting her, offering to send products and pay her to promote them on her account. 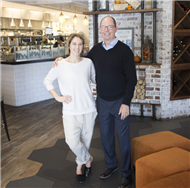 Paige Healy is chief creative officer of the restaurant company founded and headed by her father and which has grown to five restaurants — four locations of The Boathouse concept and one Casa del Barco Mexican-themed restaurant in downtown Richmond. There will be two new Case del Barco restaurants in Short Pump and Chesterfield Towne Center and a new restaurant, Shrimp Shack, that will open in Chesterfield Town Center. 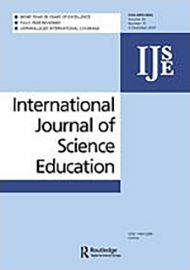 When we consider how indoor environments influence our health, we often think first of how those environments change our lifestyle, encouraging us to be more sedentary or less social. But there’s another way our time indoors affects our biology: by determining what substances we come in contact with. A 20-year working relationship between the heads of two of Richmond’s biggest players in commercial real estate has led a local construction company to dip its toes into development. Hourigan Construction recently launched Hourigan Development, a commercial real estate development and consulting company led by CEO Mark Hourigan and President Joseph Marchetti III. 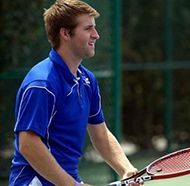 In the first Intercollegiate Tennis Association (ITA) national rankings of the 2016-17 season, the Christopher Newport men's tennis team slots in at No. 28, holding at the same spot they finished in 2015-16. Also listed in the national singles rankings for the first time in his career, junior Justin Cerny is ranked No. 49 heading into the spring season. Red shirt senior Torey Burston was rewarded with a scholarship by VCU head coach Will Wade this weekend after spending years as a walk-on with the program. Rebekah Hupp Martin ‘09 is part of the Virginia Tech research team that helped discover the cause of drinking-water contamination in Flint, Michigan. 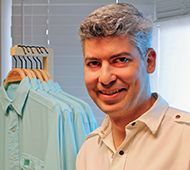 Chris Phillips, working with his mother, Laurie Phillips, created a nonprofit organization to collect and refurbish computers, and then donate them to veterans centers with the aim of helping out-of-work and homeless vets. 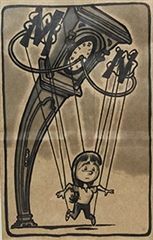 Mike’s work has been carried in newspapers and galleries and, most recently, on the lunchbags of his middle school-aged daughter, Maggy. “A true blue Richmonder, Healy grew up in Midlothian and shot his video, ‘Die Young’ at his parent’s place. He attended Trinity Episcopal School, where he started to get involved in music and play afternoon sessions at the school hang-out spot ‘Pach’s Place’”. His latest project – Colin & Caroline – has him teaming up with former Trinity schoolmate Caroline Mauck. 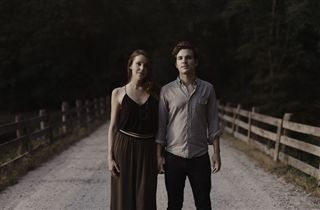 They just released their first original song, “’Fireflies’”. 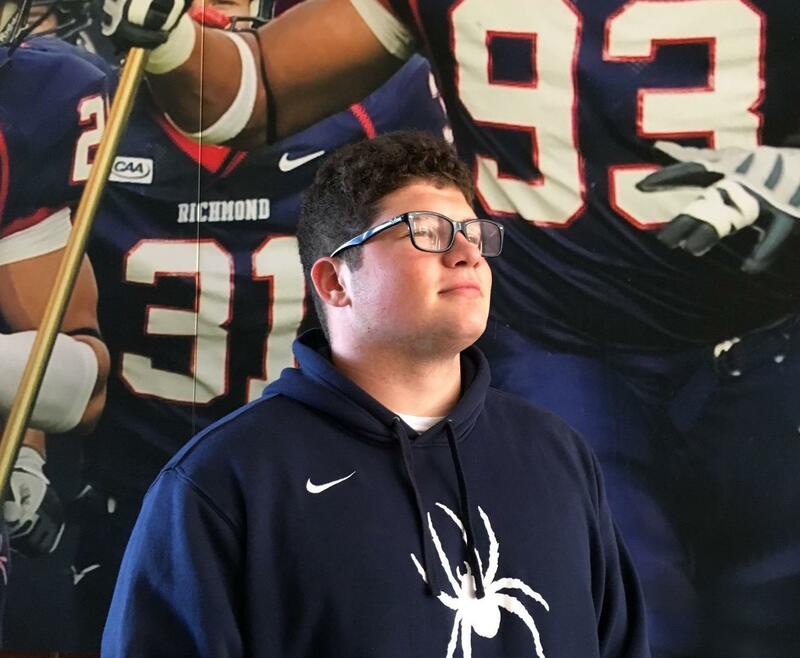 Cody Gray "perseveres in the classroom, on the field, and in the community"
Following years of perseverance, Cody Gray became the first University of Richmond senior student to be admitted to the Jepson School of Leadership Studies. 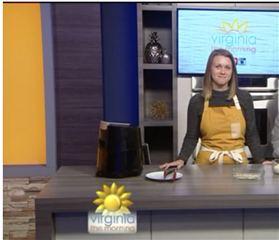 Popular local food blogger, food photographer, certified health coach, and founder of Real Food with Gratitude, Katie Brown, was featured on Virginia This Morning Kitchen to demonstrate her take on crispy, and healthy, air fried chicken tenders. The spot doubled as a promo for her appearance at the 2019 Women’s Health and Fitness Expo. Who does the new NCAA redshirt rule benefit most? 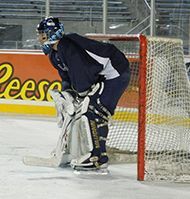 Freshmen such as UR's Foster Singleton. Singleton, playing against Prep League competition at this time last year, spent preseason practice and Richmond’s first seven game weeks learning, uninvolved on Saturdays. 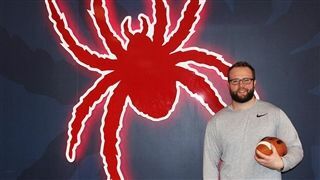 Now he is playing, primarily because of injuries to other Spiders’ offensive linemen, but without using one of his four seasons of eligibility. Tony Oates '15 is in his second season as a professional dancer with the Richmond Ballet. Oates started dancing when he was 8 years old. This year is his second with the Richmond Ballet. Trinity’s own Colin Healy ’08 and Caroline Mauck ’07 are the duo behind “More than Gravity,” featured on the Netflix orginal show, "13 Reasons Why." 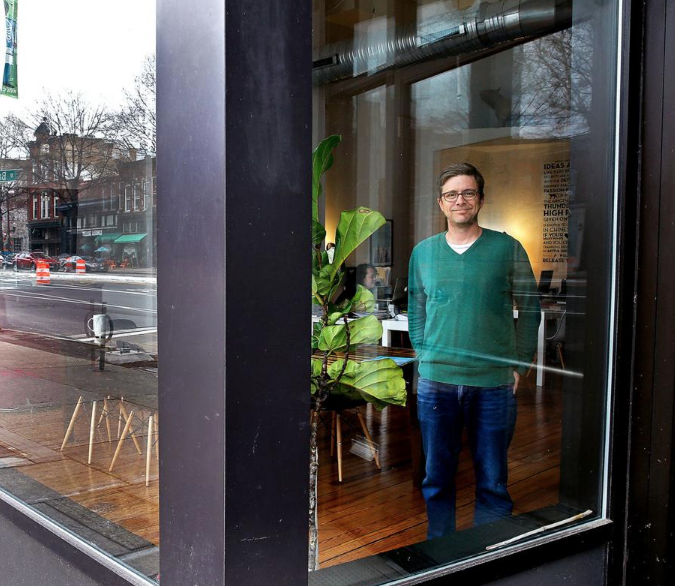 “John Mills was ultimately selected because of his years of experience and the unique way in which Release The Hounds operates,” said a spokeswoman for the Advertising Club of Richmond’s board. 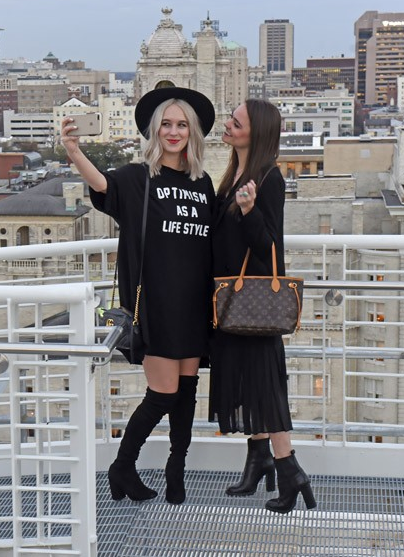 When Catherine Pfab and Rebecca Ott found themselves back in Richmond after college and itching for a creative outlet — despite not identifying as writers or knowing much about the blogging world — the idea of a fashion blog made sense. With little guidance and only a desire to share their passion with anyone who would listen, they raided their closets one weekend, compiling a collection of outfits that showcased their personalities and traipsed around Richmond with a camera. 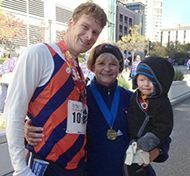 Persevering in spite of a childhood disorder is not an easy feat, yet Oldfield has never let it hold him back. A student, an athlete, a manager and a friend, Oldfield has always let his happiness lead him to his success. “Success does not lead to happiness, happiness leads to success and that’s my life motto,” Oldfield said. Every day, Maggie Jenkins’ turkey sandwiches come wrapped in a hand made, one of a kind work of art courtesy of her dad Mike, a political cartoonist turned caricature artist. It's been a blazing hot summer but, despite the heat, the organization Bike and Build is pressing on in their efforts to build affordable housing. 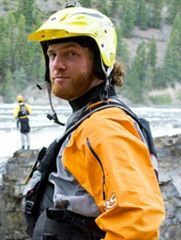 This non-profit sends riders across the country to raise awareness and money to help the cause. They even stop along the way to build affordable housing. Since its founding, Bike and Build has had over 3,500 riders who’ve spent 200,000 hours building housing across the country. They've also raised over 6.2 million dollars. Just over two years ago, doctors told Michael and Kelly Blumenthal that their unborn son had a congenital heart defect. After eight months in the hospital and ten surgeries, the Blumenthal’s brought their baby boy home. Finn is now a living symbol of hope. Austin Zajur, a 21-year-old actor from Richmond, makes his big-screen debut Friday, Feb. 17, in the film “Fist Fight,” starring Ice Cube and Charlie Day. The Trinity Episcopal High School grad has been traveling from Richmond to New York since middle school, trying out for roles. 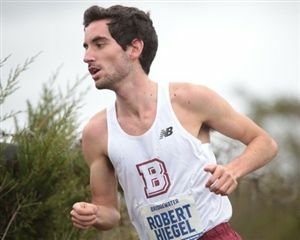 At the NCAA South/Southeast Regional Championships, Hiegel clocked a time of 26:00.09 to finish 14th overall and earn his second consecutive All-Region award. The Richmond, Va., native has had an exceptional second-year campaign after garnering ODAC Rookie of the Year honors in 2015. He won an individual championship at the Hornet Harrier Invitational (Sept. 24), was named ODAC Runner of the Week and claimed first team All-Conference accolades at the ODAC Championships (Oct. 29). The Intercollegiate Women’s Lacrosse Coaches Association (IWLCA) announced that the Villanova women’s lacrosse team was named an IWLCA Zag Sports Academic Honor Squad for the 2015-2016 school year. Five student-athletes were also recognized by the coaches’ association for their performance in the classroom. Current senior Becca Hetrick (Midlothian, Va./Trinity Episcopal School) was named to the IWLCA Zag Sports Division I Academic Honor Roll. 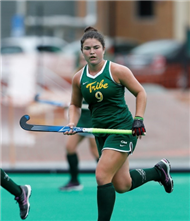 William & Mary freshman Annie Snead (Midlothian, Va.) was named the Field Hockey Rookie of the Week on Tuesday by the Colonial Athletic Association, after scoring her first career points over the weekend. Snead's award, the first of her career, is also the first of the season for the Tribe field hockey team. 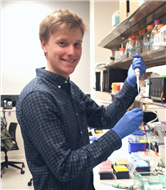 Robert Warneford-Thomson '08 is a PhD student from UPenn who is conducting research on how polycomb repressive complex 2 (PRC2) is recruited to different locations in the genome. William & Mary sophomore Cammie Lloyd (Midlothian, Va.) was named the Colonial Athletic Association Player of the Week on Tuesday, September 18, 2015, after leading the Tribe field hockey team to a pair of wins. Lloyd scored for the first time in her career on 12 minutes into the game Friday night against Ohio, and before the halftime horn blew added two more for the hat-trick. Jordan Tarsovich was selected by the Los Angeles Dodgers in the 22nd round of the MLB draft. "I feel very fortunate and extremely excited to continue my baseball career with the Dodger organization," stated Tarsovich. Jeff Jones began his involvement with college basketball in 1978, the first of his four-year run as a guard on some of Virginia’s most memorable teams. He then coached, at U.Va., American and now, Old Dominion. 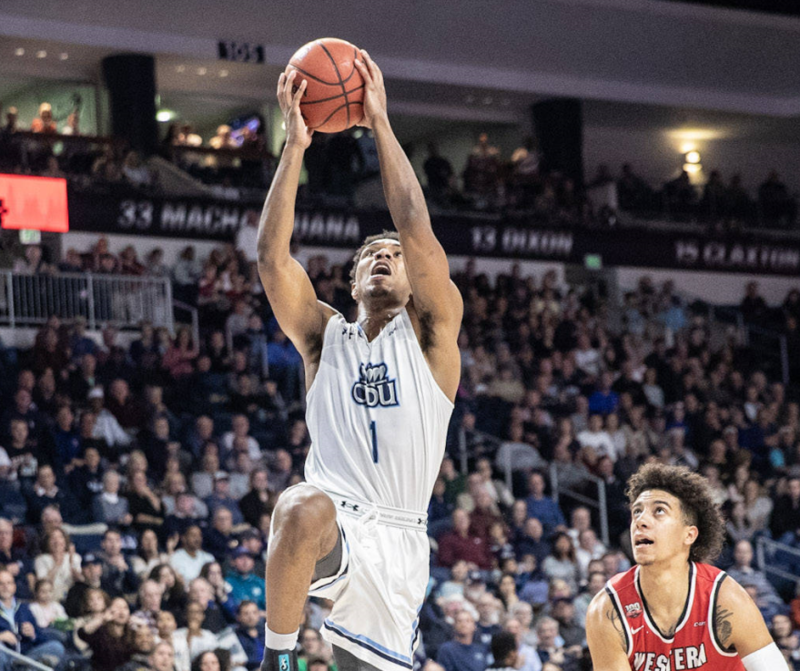 So when Jones recently said that 6-foot-5 Monarchs freshman Jason Wade, a graduate of Trinity Episcopal, “is about as competitive as any student-athlete that I’ve ever been around,” that carries some oomph. 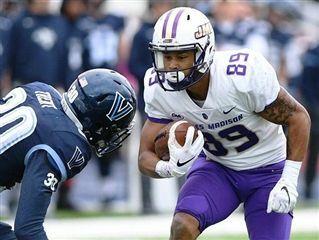 Jake Brown '16 embodies "Wally Pipps's tale"
For sophomore Jake Brown '16, the opportunity to showcase his receiving skills presented itself following another teammates injury. In that game, he caught each of the five passes thrown to him in the first quarter and has continued to play with an impressive consistency. 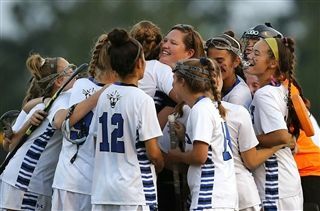 Deep Run's field hockey coach, Rachel Haislip '00, notched her 100th win in the opening game of her seventh season with the team. 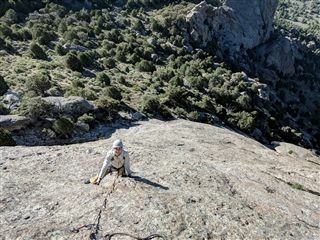 Nadia Khoury ’15 spent the summer climbing mountains across the U.S.
For eight years, Rupa Murthy worked at Virginia Commonwealth University as director of development for the psychiatry department. 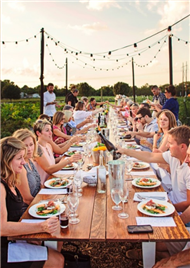 She initiated a fundraising strategy for the Healthy Minds Campaign, which culminated in 2014 with the Virginia Treatment Center for Children. Murthy is passionate about children's education as well. She continues to advise Mayor Levar Stoney's office on education issues after serving on the mayor's transition team. Charlotte Woods '16 was featured in an article about her basketball season at Macon. 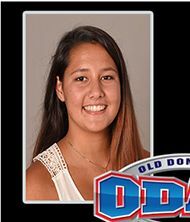 She is a sophomore this year at R-MC. "Williams, a sophomore, ranks fourth in the nation in Division III in scoring, and leads the nation in rebounding." A year after rescuing a startup that was on the fritz, a local father-and-son duo has rebranded the company’s flagship product which caters to homebrewers. Father Chris and son Conner Trebour last month unveiled BrewPerfect, the new incarnation of a WiFi-enabled hydrometer for homebrewers, a device they inherited after purchasing Newport News-based SensorShare in November 2016. Encouraging middle-schoolers to become enthralled with English can be about as simple as teaching a family pet how to manage mutual funds. 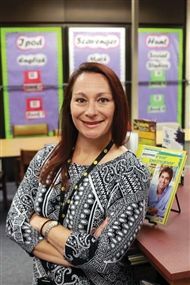 But Christine Guise takes a simplistic approach to engaging her sixth-grade English students at John Rolfe Middle School. 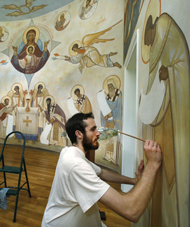 Now a senior at VCU, Scott is double majoring in art education and craft/material studies with a minor in art history. Yet even with such a full course load, she finds time for her other passion: volunteering and service to others. As a sophomore, she entered the VCU ASPiRE (Academic Scholars Program in Real Environments) program. She is devoted to her role as a black student leader on campus… Scott also is co-founder and president of Black Art Student Empowerment at VCU, a student organization that strives to be a catalyst for change in the art community. Emma Hern ’11 performs her new son, “Moonlight,” on Nashville’s WSMV morning show. Former City Councilman and Trinity alumnus Jon Baliles has been appointed “senior policy adviser for innovation” in the new administration if Richmond Mayor Lear Stoney. 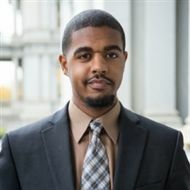 In the position, Baliles will “help the mayor improve the efficiency and accountability of government operations, increase the city’s economic vitality and growth, and help chart a course for planning the future of our neighborhoods and commercial areas,” according to an announcement. John Mills, owner and creative strategist for local branding agency Release The Hounds, is collaborating with RVA-based label EggHunt Records for a month-long public experiment that is giving viewers an insight on how music is made, and helping improve music education programs in the city along the way. When someone asks you, ‘Do you want to interview at the White House?’ you don’t really say no.” That’s how Hudson came to work for the first U.S. president to fully embrace the digital age, including with his own Twitter account, @POTUS. The latest class of Henrico County Police recruits took a break from training last month to shoot a funky music video. 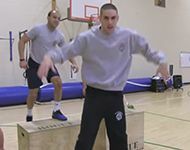 The 59th Academy recruit class’ video shows them working out to the Bruno Mars/Mark Ronson hit “Uptown Funk.” The video stars Recruit Logan Miller, a Longwood University graduate, dancing around while his fellow recruits workout (and try not to crack up).